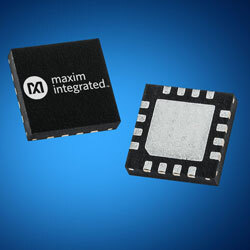 Mouser now stocks MAX5995B PMIC from Maxim Integrated. The small PMIC offers a complete interface for PD to comply with the IEEE 802.3af/at/bt standard in a PoE system. The company’s PMIC presents the PD with a classification signature, detection signature, and an integrated isolation power switch with startup inrush current control. The IC supports a multi-event classification method as defined in the IEEE 802.3bt standard and offers a signal to indicate from Type 1 to Type 4 PSE. The PMIC also gives a PG signal, two-step current limit and foldback control, and over temperature protection. The device features an Intelligent MPS function, an input undervoltage lockout with wide hysteresis, ultra-low-power sleep mode, and long de-glitch time to recompense for twisted pair cable resistive drop and to ensure glitch-free transition during power-on/-off conditions. The PMIC is provided in a 16-pin, 5mm x 5mm TQFN power package with an operating temperature range of -40C to 85C. The PMIC is perfect for IP security cameras, VOIP phones, wireless access points, lighting, small cell and picocell base stations, and building automation.